Backflow is the unwanted reverse flow of contaminated water through clean water in cross connection systems. A cross connection system is one that has any connection between a public water system or consumer’s potable water system. For example, domestic water, fire, irrigation, boiler, and chilled water systems that connect with either public or consumer water systems are considered cross connection systems. In order to prevent this contamination, backflow prevention devices are set up. The device commonly consists of a pair of mechanical valves, that hinders dirty water from reverse flowing in an unexpected change in water pressure. These devices must be checked to ensure they’re doing their job, which is where backflow testing comes in. Backflow testing is the annual inspection (required by the State of Colorado) of backflow prevention devices in cross connection systems. During the inspection, check valves, relief valves, buffers, air inlet, and shut off valves are all tested to ensure proper operation and function. The tests take from 10 to 30 minutes per device. Since backflow prevention devices play a key role in keeping clean water pure, it is required by the State of Colorado through your local water department to get a backflow test once a year. If your device is not tested and thus results a malfunctioning system, clean drinking water is at risk to be contaminated by dirty water. The dirty water can be polluted with feces, pesticides, chemicals, and other hazardous materials making that water dangerous to consume. In order to ensure clean water stays clean, backflow tests must be performed. That’s why it’s so important to find a trusted company that provides backflow testing in Denver and throughout the Rocky Mountains. 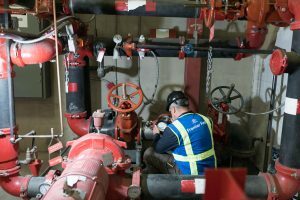 Frontier Fire provides top of the line backflow inspection, backflow repair, and backflow testing in Denver, as well as the Rocky Mountain region. We have offices in Denver, Colorado Springs, Fort Collins, Rifle and Salt Lake City. We have an inspection team that is certified in backflow inspections, including domestic, irrigation, and fire devices. Backflow devices must be checked in terms of function and composition on an annual basis. We provide inspection reports to the customer and the water authority that reflect the standing of each device annually. Devices are tagged at the time of inspection to reflect being up-to-date. We have a certified team of sprinkler fitters who service backflow devices, such as repairing any broken devices or replacing irrigation and fire devices (we do NOT replace domestic devices). These services are typically the result of an inspection, although we do sometimes get calls just for backflow repairs.